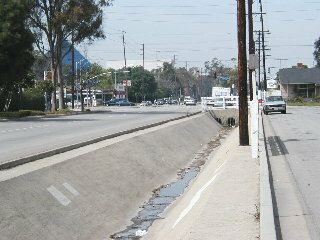 (March 31, 2004) -- There's a good chance federal taxpayers will pay $600,000 to "provide landscape enhancement of an existing open culvert on Atherton Street [in] Long Beach." The item is one of several on a long-standing City Hall federal wish list successfully incorporated in the House version of a $275 billion national transportation bill through the efforts of Congresswoman Juanita Millender-McDonald (D., LB-Carson), a member of the House Transportation and Infrastructure Committee. 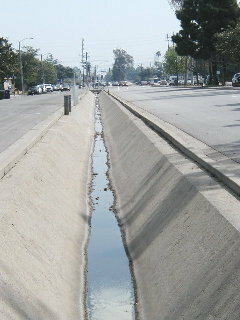 ...and then continues as an open trench eastward to Knoxville Ave. before emptying into the Los Cerritos flood control channel. The paved culvert has been a sore point for nearby residents and part of City Hall's desired federal appropriations for years...but has become an issue in LB's 4th district Council race, where incumbent Dennis Carroll is being challenged by Los Altos resident Patrick O'Donnell. Mr. O'Donnell backs a number of neighborhood residents who want the open culvert covered, not potentially made permanent. 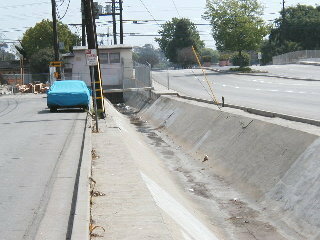 The trench has also been a sore point for Councilman Carroll, who publicly bristled last year during a report to Council on mosquitoes carrying the potentially deadly West Nile virus when city staff indicated (accurately) that sources of standing water, including flood control channels abundant in ELB, were potential breeding grounds for the disease-carrying pests. When staff noted that these sources required ongoing attention from vector control, Carroll expressed frustration that city staff had highlighted a point seemingly without a conclusive solution...and Carroll cited the Atherton St. ditch as a chronic example in his district. Local residents have told LBReport.com that on Saturday morning March 27, Councilman Carroll attended some kind of on-scene event to announce House Committee approval of the federal funding item. However, the Councilman has run into opposition from some of his own constituents. "Landscaping does nothing to deal with the mosquitoes and odors," says Daryl Supernaw, who adds that he's lived in the district for roughly fifty years and followed the issue "for about the last twenty years." Mr. Supernaw referred us to other residents who want the culvert covered...and he says that a similar open culvert on Stearns St. was covered in the 1970s under former Councilman Tom Clark. Mr. Supernaw said, "It's not clear exactly what "enhancements" they have in mind for us, but kids can scale a fence." Although the federal funding item has been part of City Hall's federal wish list for some time, challenger O'Donnell charged that incumbent Carroll "has been making promises about the drainage ditch for four years without any action. I find it highly suspect that two weeks before the election he announces this plan without any action to back it up...[T]he bill does not even say that the money will cover the ditch. This sounds like just another election time gimmick." A telephone message left by LBReport.com with Carroll's office was not returned. Asked face to face about the federal funding item by LBReport.com after a March 30 candidate forum, Councilman Carroll responded, "no comment at this time." Asked whether the federal funding item was consistent or inconsistent with covering the culvert in the future, Councilman Carroll again responded, "no comment." 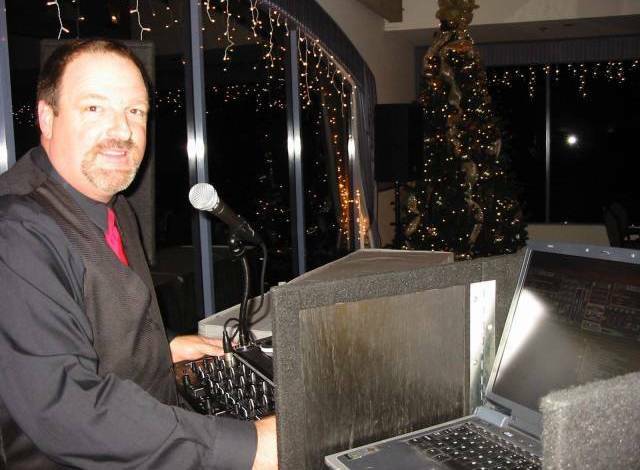 LBReport.com also sought comment via email from Bruce MacCrae, who in recent months formed a Los Altos homeowners group of which Carroll has spoken approvingly. Mr. MacCrae, whom Carroll has named to a City Hall-chosen committee now examining possible City Charter changes, emailed on the evening of April 2 that he had not received any communication from us. Federal money for the project, which is part of a list of "high priority" projects in the federal bill, isn't a done deal yet. The multi-billion dollar Transportation Equity Act: A Legacy For Users (TEA-LU) must still pass the full House of Representatives (expected) and survive a House-Senate conference committee (to resolve differences in the Senate version; that outcome is uncertain). President Bush is expected to sign a final bill if it doesn't bust White House budget limitations.